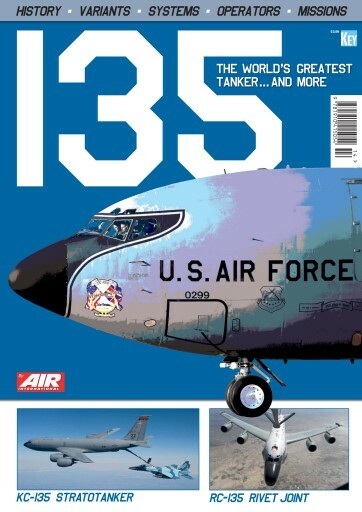 Produced by AIR International’s worldwide team, 135 The World’s Greatest Tanker...and more, is a 100-page publication giving a comprehensive profile of the KC-135 Stratotanker and all remaining special mission variants led by the RC-135 Rivet Joint. A synopsis of the evolution of Boeing’s veteran tanker. Details of the KC-135’s engines, air refuelling boom, cockpit and upgrades. Maintaining 57-year-old aircraft for daily operations requires skill and diligence by dedicated maintenance personnel – we provide a special report from the main air logistics depot in Oklahoma City and behind the scenes insight into the work of the RAF Mildenhall-based 100th Air Refueling Wing. Seven major US Air Force commands and four allied air forces fly KC-135 operations around the world: we present comprehensive coverage. AIR International visited Edwards Air Force Base and the 412th Test Wing – home of the KC-135R ‘Speckled Trout’ and flight test tankers. Offutt Air Force Base near Omaha, Nebraska is home to Air Combat Command’s 55th Wing and its fleet of OC-135, RC-135, TC-135 and WC-135 aircraft: we detail the aircraft, the systems and the missions.